Obituary for Jaunita D (Dowling) Jolly | Newman Mortuary, Inc.
MRS. JUANITA D. JOLLY PASSED AWAY ON WEDNESDAY, MARCH 20, 2019. SHE WAS 93 YEARS OLD. SHE WAS BORN NOVEMBER 5, 1925 TO THE LATE OLIER AND RUBY DOWLINGS. SHE ATTENDED DALE COUNTY, OZARK SCHOOL THEN WENT ON TO ATTEND ALABMA STATE UNIVERSITY AND FLORIDA A&M. 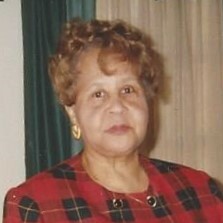 JUANITA JOLLY WAS A LIFE LONG MEMBER OF ST. PAUL A.M.E. CHUCH. WHERE SHE SERVED IN MANY POSITIONS. SHE WORKED AT THE DEPARTMENT OF HUMAN RESOURCES AS A FOOD STAMP CASE WORKER FOR MANY YEARS UNTIL RETIREMENT. SHE WAS A GOD-FEARING CHRISTIAN WOMEN WITH A MSSION OF SERVING GOD AND HIS PEOPLE. SHE WAS PRECEDED IN DEATH BY HER PARENTS, AND A SON WINSLOW LATHAM. HER MEMORY WILL BE CHERISHED BY THEIR SON EARL (AMELIA) JOLLY, OZARK., AL. SIX GRANDCHILDREN AND SEVEN GREAT GRANDS.